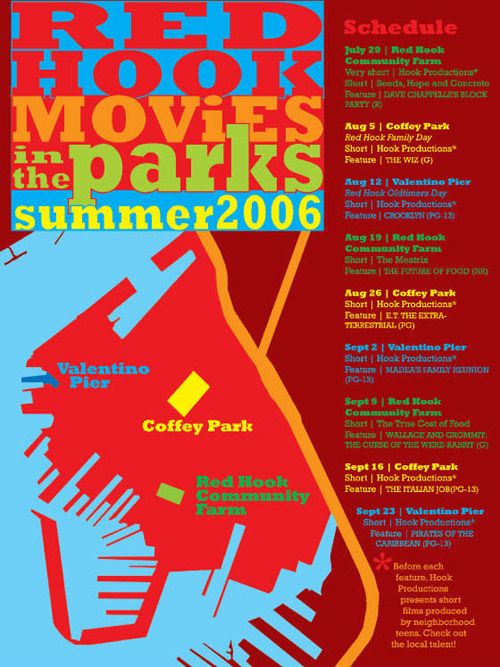 Big ups to the blog Z. Madison for promoting the Red Hook Movies in the Park Summer 2006 series. The venues for the series, which runs through September 23, are Coffey Park, Valentino Pier and the Red Hook Community Farm. Hook Productions is presenting short films produced by neighborhood teens before each feature. The schedule includes Dave Chappelle's Block Party on July 29 at the Community Farm, The Wiz on August 5 at Coffey Park, Crooklyn on August 12 at Valentino Pier, The Future of Food on August 19 at the Red Hook Community Farm, E.T. on August 26 at Coffey Park, Madea's Family Reunion on September 2 at Valentino Pier, Wallace and Grommit on September 9, The Italian Job at Coffey Park on September 16 and Pirates of the Carribean at on September 23 at Valentino Pier. my pleasure, darlin! i'll be there with bells on for E.T.